Eight different stadia to visit in Madrid was my plan. Sod the boring musea and time to express my visit for what gives me most passion - football. If they would let me into the stands then even better. If not, then a walk around the ground to sample the community where the clubs were based would suffice. No spending all day in an Irish Pub for me - and being a solo traveller meant things could be done at my own pace. Spain uses a different system when it comes to building their squads. Their reserve sides are allowed to play in professional leagues and first stop with backpack still on from the airport was where Real Madrid "B" (or Castilla) play at the Alfredo di Stefano stadium. 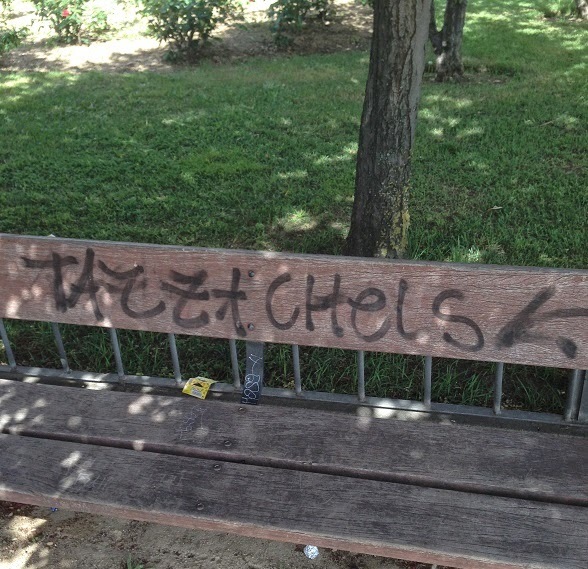 They play in their second division. It is right next door to where the first team train and despite heaving my lugs off to get there for some reason the security guards armed with guns would not let a sweaty man with a rather large, black rucksack into the area. No, "death to infidels" chanting from me either! It was amazing to see how close the stadium was to Madrid Airport - only a stop away with beautiful mountains in the background. So how many birds could one kill with one stone? 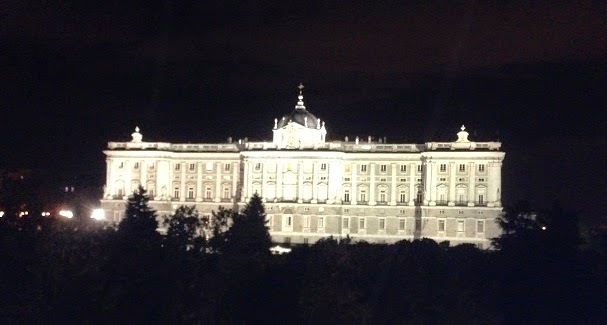 On the same day as the Chelsea match I did the touristy thing and visited the Bernabeu Stadium. 15 Euros with no guide and a pretty regimented route around the ground. The sales staff were quite pushy that you should have your photos taken against a blue background and would not intially accept my polite, "f**k off" as a clue that one did not want to be seen next to Gareth Bale's mug. 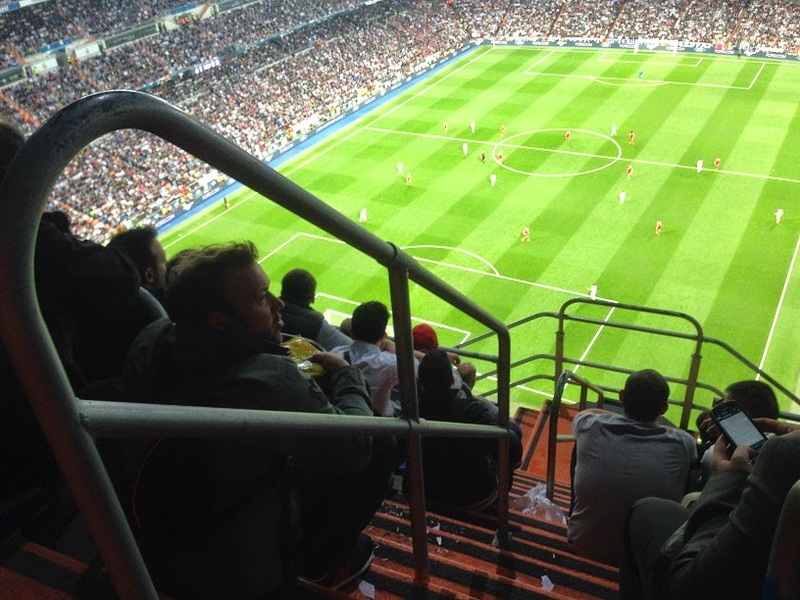 Changing rooms were seen and a stadium to knock off the list in case there were no tickets available for the Real vs Bayern game the following day. 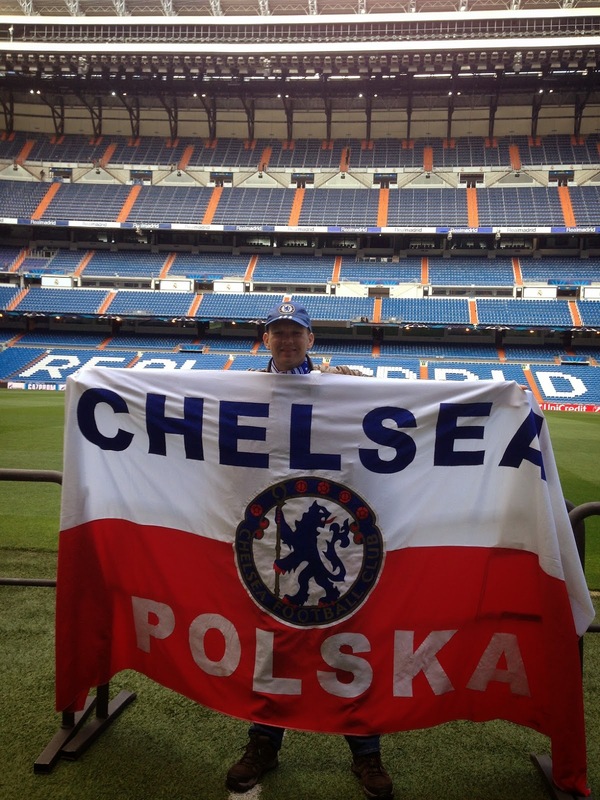 Boy, were they pleased to see me raise my Chelsea/Polska flag in the managerial area to have a photograph taken. Next stop was the hotel. 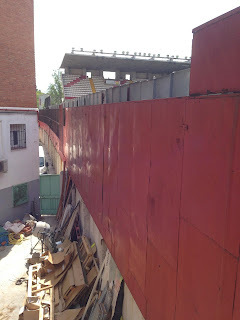 Dumping the bag, a quick tramp's shower with the old deodorant and off to my third port of call - the third oldest club in Madrid... RCD Carabanchel who play their football in one of the third divisions (of which they have many). Although disappointing to see the club plays on astro turf, it was also great to see some sense of community with fans allowed to be able to watch the club training with the token teenage girls giggling amongst themselves deciding which players they fancied the most. 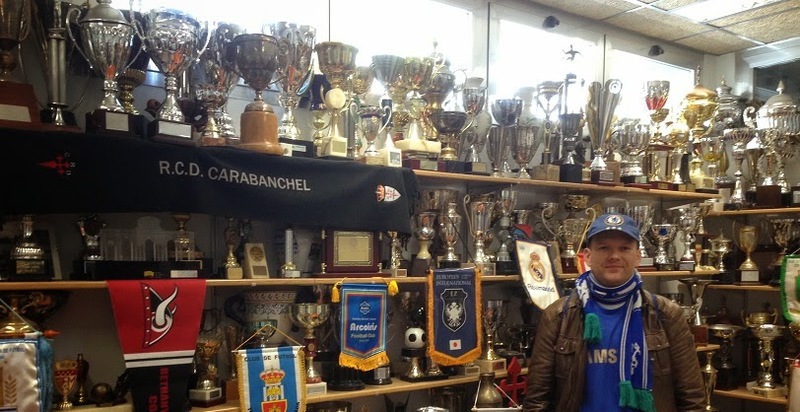 The welcome was warm and friendly and they even invited me to see their trophy room. Their stadium fits 2,000 fans although it is hard to imagine it full... nevertheless the nerd element in me was satisfied having seen a few plaques which commemorate it having achieved Royal status in 1997. 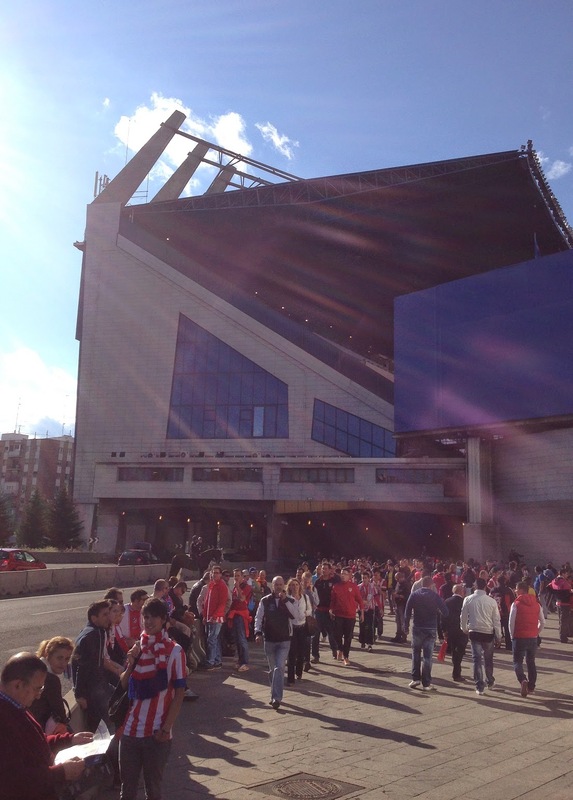 Next off to the most obvious stop - Atletico Madrid's stadium... Estadio Vicente Calderon. It is a fascinating place - right next to the Manzares River that divides the city's East and West parts... but unlike Fulham a stadium that holds nearly 55,000 people. Even more bizarrely is that the club has 65,000 season ticket holders which I still cannot figure out. The main stand is built above a motorway. Yes - a motorway. The atmosphere from their fans was great with no animosity. The only negative was the usual OTT stewarding and only four unisex workman's toilets for our upper tier that held over a thousand fans. My flag could not be hung over the edge of the upper tier as it blocked the Champions' League logo... but no problems for home fans to do the same. "Why? ", I asked.... "Because we have fewer stewards in the home end and cannot police it." My blood boiled. Now I do not wish to bite my nose to spite my already ugly face, but we seem to be quite lax with the away end at Stamford Bridge. Personally, I like the away fans to bring some atmosphere and colour to the ground and especially during the group stages their antics can be more entertaining than the football itself. It does take away some of the positive feeling you have from trips following Chelsea abroad and with no roof on our end and wind blowing... plus being sober... meant that my posterior was freezing by the night's end. The match was what should be described as a brilliant tactical away display at a key stage in the most respected, lucrative football competition in the world. We played a side that is above two teams called Real Madrid and Barcelona in their domestic division - and we made them look quite ordinary. Needless to say, the "bus parking" tactics have been used as a criticism... we should remember this should it lead to a trophy parade on a double-decker in London. When it comes to the crunch, our team performs well although without Terry and Cech one does worry and the gut feel is that we go to penalties next week. Thanks for the welcome Atletico Madrid fans... all very down to earth and what real support should be like... just as they were when we met in Monaco. Chelsea please take note of stewarding at aways we attend although we all appreciate the subsidised ticket costs. Chin up for next week chaps and let's stay positive - noone likes us and we don't care! One should never underestimate the psychological power a traditionally strong person or - in this case - a set of clubs can have on the subconscious of individuals. It is not necessarily childish to think in such a manner. The reality of our club's failure to win key matches against alleged inferior opposition is down to a mixture of things. We have not taken our chances in front of goal and that is on a level par with some poor refereeing decisions that have cost us matches. There are some games such as Crystal Palace away where you hold your hands up and simply admit that the opposition was superior on the day (and has been on a stunningly good run since). Yesterday, we had 31 attempts to score and only managed one goal. To describe our side as one that does not attack is simply untrue. However, the quality of finishing has not been up to standard. Does our concentration occasionally drop against the bottom sides? The next point is refereeing decisions that have not gone our way. Despite my obvious bias for my club it is difficult to argue against Chelsea deserving at least one penalty during the match. Sometimes there are trips in the corner of the box that are rewarded with a spot kick even if they were unlikely to have led to a goal. But the push on Ramires in the first half as he jumped to head the ball towards an open goal cannot be described as anything less than a foul despite some bizarre conclusions by television experts. You can almost excuse Ramires' ire when yet again he walked a tightrope by slapping a Sunderland player's face during the second half. Standing in the front row of the East Upper after the final whistle you reflected on the game and on football in general. Then you wonder about our fans who were asked to get behind the team and yet were quiet and impatient for the bulk of it. Do we pay good money now in order to be entertained rather than traditionally support our club when things are not perfect on the field? There are times when one would prefer to have the blind myopia that the bulk of Liverpool fans have when supporting their club... And should they win the league then well done to them. But it will be a bitter blow to Chelsea if that is the case and you do wonder if invisible, external forces affect the team when the media argues that "neutrals" would prefer others to succeed over our side. Well done Gus by the way - Chelsea legend - and apologies for how some of our fans have behaved to you in the past.